The application of QRS’ saw tooth wave signal transports ions out of the electrolytic fluids and into cells. This is the only known method of achieving ion transport. It also enhances the ability to separate ions and in particular to stream the hydrogen ions. The hydrogen ions stream through the electrolytic fluids (blood and extra-cellular fluids) and bump into obstacles in the form of cell membranes. Calcium is bound to negative charges in the protein layer of the membrane. The positively charged hydrogen ions combine with the negative charges bonding to the calcium and release calcium ions. This causes calcium cascade. The calcium moves into the intercellular fluids and differentiate into cells requiring calcium (such as bone and nerve cells) or are removed to waste. A result of the calcium cascade in the blood is that calcium deposited on the walls of the vessels is set free. This in not an immediate occurrence but one that occurs over a period of six months or more. It means that arteriosclerosis processes (narrowing of the vessels) can be stopped and reversed. 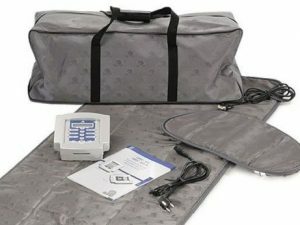 e. Blood pressure sensors normalize the blood pressure. In the medulla oblongata, a part of the brain on the extension of the spinal cord, there are vibration producers for the blood pressure which react positively to the calcium effect of the magnetic field and lower or raise blood pressure. j. The fatty acid metabolism is normalized. Although some people may lose weight through QRS treatment, that does not provide an excuse for eating more. Because PEMF helps break up clumped blood cells, when used in conjunction with HBOT, PEMF enables the blood to hold even more oxygen. Click here to learn more about the power or PEMF. Click here to learn more about the the iMRS PEMF. Watch Video to learn more about HealthyLine Multi-Therapy PEMF Mats.